Language Arts: Four-year-olds are learning to recognize their name. Students practice phonological awareness, rhyming, beginning letter sounds, & identifying syllables. Moveable letters are used to practice "writing" common words and names. Students enjoy story-time one or more times each day. 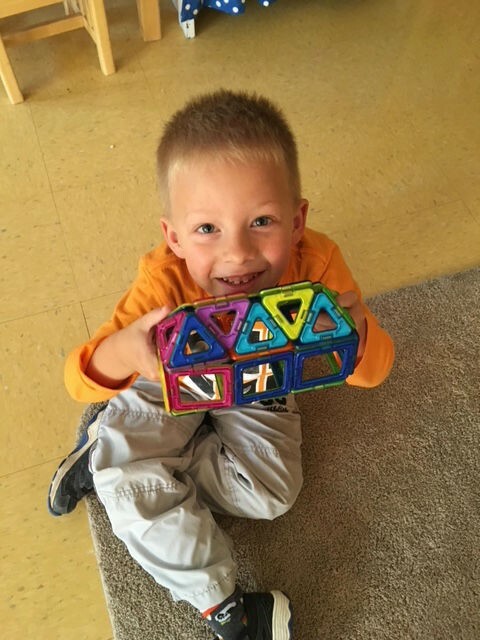 Math: Math concepts that are introduced in the 3 year old program will be reviewed in the 4 year old program, including shapes, number recognition rote counting and counting objects. They will also be introduced to adding and subtracting and simple story problems. Science and Social Studies: Students will be engaged in a variety of science discovery throughout the year. They will learn and discuss age appropriate historical events. Bible Time: Bible stories and songs are shared with the children; they attend Chapel each week. Gross Motor Skills : Faith Preschool has a large gym facility that the students go to almost daily to engage in large motor skill activities such as riding scooters, playing tag, bean bag games, free play and much more. Art Activities: Creating art projects is a fundamental activity that allows students to experiment with scissors, glue, paint and a variety of materials. This is a great time for the students to practice their skills with color and shape identification! Listening Skills: Listening skills are an integral part of the preschool day. Children learn to listen to teachers, classmates and other adults. They practice following multi-step directions.